We are all familiar with the Berenstain Bears, their many adventures, and the lessons they have taught young readers for over 30 years. 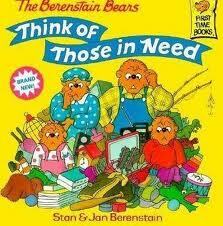 However, The Berenstain Bears Think of Those in Need is more timely than ever and one of the best books to be written by Stan and Jan in recent years. It seems that society is more materialistic than ever, and people especially in the United States have more "stuff" than they know what to do with. Perhaps the most spoiled are our children, surrounded with toys, games, computers, clothes, and more than they could ever need throughout a lifetime. This book gives children (and their parents!) a wonderful example by making the point that even though things are good for many of us, not everybody is as well off. 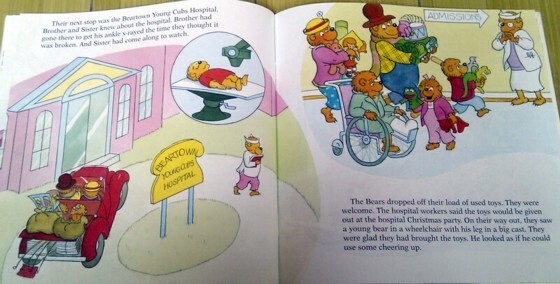 It seems that the Berenstain Bears have taught almost every imaginable lesson regarding good behavior at home, but now we are seeing a wonderful example of social conscience/responsibility. Especially in Bear Country it may be hard to imagine anything bad ever happening, but the Bear Family reminds us that there are always people to help, and the things we don't need can always be used by others.